If you appreciate the art of French distilling and happen to be a fan of single malt whisky you are going to like Armorik Breton Single Malt Classic. The only whiskey in our exclusive French spirit portfolio is one of only a few serious French whiskies in existence. 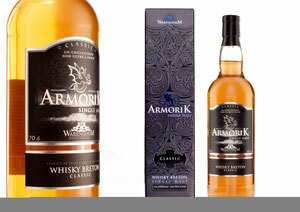 Armorik Breton Single Malt Classic Whisky is an exercise in careful balance resulting in an ideal taste experience.